Requirements: Modded/Chipped Ps2 or Swap Magic Disc Method. Compressed with 7Zip, Game was tested and works. (allows playing of backups), or if you use Swap Magic. 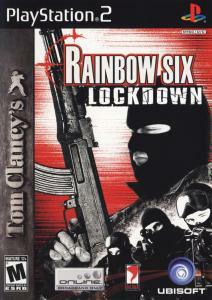 Lockdown is the third Rainbow Six game to appear on the consoles, this time with Red Storm Entertainment fully behind the wheel. Once again, you play as Domingo 'Ding' Chavez, leading a small commando team on black-ops missions. This time, however, the developer strays from the realistic squad-based action in favor of more arcadish gameplay. The main single player campaign is based around a dangerous virus and hostages. In certain missions, you play as sniper Dieter Weber, picking off terrorists from higher ground and providing cover while the team infiltrates the building. The differences between the console versions are the number of missions and the availability of certain gadgets. There is an offline two-player, split-screen cooperative mode available (up to 4 over Xbox live) and full online multiplayer up to 16 players featuring traditional deathmatch, objective-based games and CTF modes, on Xbox and PS2. While the PS2 version includes a Rivalry mode, Xbox online multiplayer has an RPG element: the P.E.C. mode (Persistent Elite Creation). Before playing, you choose an avatar and a class with specific abilities (commando, engineer, spec op and medic). While playing, you earn credits and experience, which can be traded in for new weapons, items or amour. Gear regularly needs to be repaired, shown by the durability level, and experience can be used to assign skills points to abilities, individualizing your character. realism and spectacular close quarter firefights. * Increasingly intelligent enemy A.I. * New weapons and equipment. Burn with DVD Decrypter, (Included in download). Burn at 8x or 4x Speed. If Using DVD+R booktype to DVD-ROM. Any Problems or questions please post a comment. If this is working fine for you let us know write a comment. Please Seed this when your done. (I can't seed 24/7, do your part and seed to keep the torrent healthy). You have been uploading for 3 years now , Thanks alot for all your efforts . So I have a European PS2, I can't use this? Its not about your ps2, its about your tv!